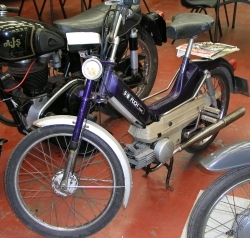 A relatively rare make of moped in the UK, this example has had only two local owners from new and was recently donated to the museum by Mr George Moulton of Lincoln. The Puch company was founded in Graz, Austria, in 1899, and became associated with Damler in the late 1920s. The bicycle style pedals, normally used for starting, can also be used to power the moped as a bicycle.